What do people expect when they hear “World-class BBQ from the Northeast?” Sometimes delivering on expectations means challenging assumptions. When celebrity chef Andy Husbands decided to launch a new restaurant based on his World Champion BBQ, he came to Blackcoffee to develop a brand strategy and identity that would position the restaurant to become an institution. How a restaurant addresses the little things tells you a lot about the thought and care they put into their food and how they think about hospitality. BBQ is BIG, but it’s about balance. This thinking was at the heart of everything the team created. From the menu to music, the Smoke Shop offers an experience that embodies Husbands’ approach to, and respect for, BBQ. 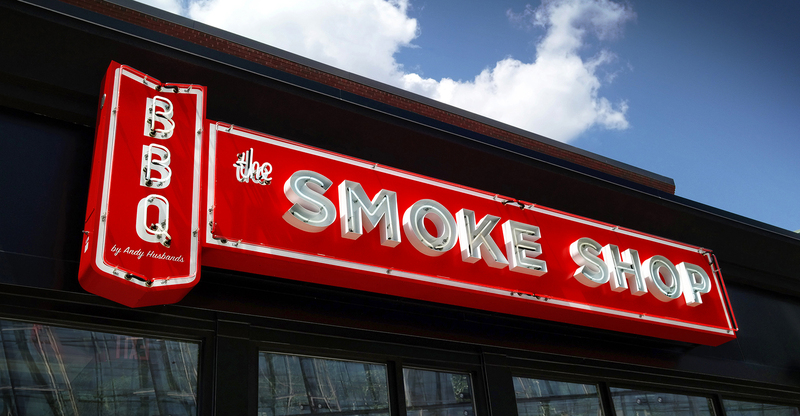 The Smoke Shop’s brand extends from restaurant to retail. The materials, textures and techniques common to BBQ and its culture have been considered at every touch-point. Rather than the typical rustic southern restaurant, the Smoke Shop straddles the line between upscale and down-home. This juxtaposition is reflected in the brand’s identity. 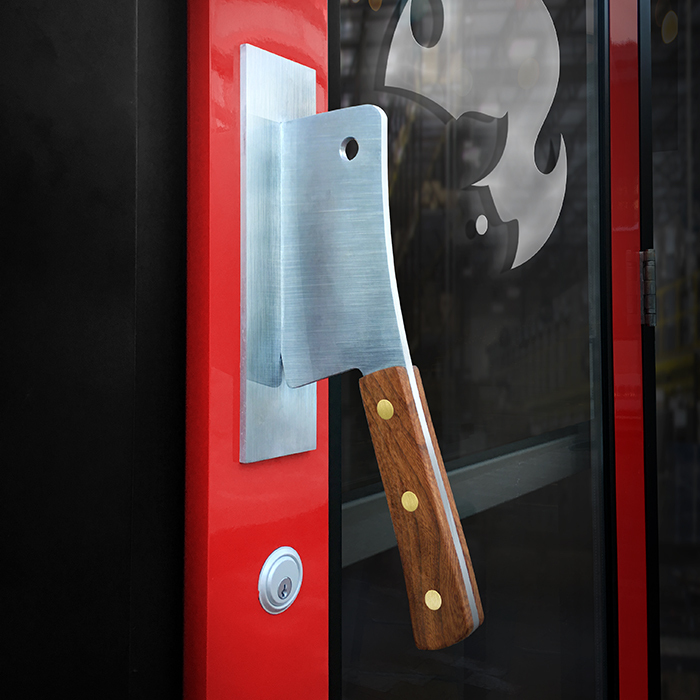 From “The Flaming Pig” logo to the life-sized cleaver door handle, you know you’re in for something special. “The Flaming Pig” logo is a unique mark that, like chef Husband, brings together common elements of BBQ to create something that is equally unexpected and comforting. While the food is on point, it’s anything but fussy. Distressed graphics give continuity to an eclectic identity. From T-shits to menus, the logo and design treatment drew from rustic wood-cut techniques to create an effect that brings grit to what could otherwise be seen as too refined. Where logo cropping is largely frowned upon in the design world, we focused on brand aesthetic over design norms. This technique was utilized to give texture to the underlying design language. To differentiate between those who take diner’s orders and those that deliver food and clear dishes, each wears a different colored shirt; Red to stand out (for those who interact with customers) Grey to blend in (for those who don’t). The Smoke Shop’s retail packaging allows people to bring home more than their leftovers. The negative space of the logo gets filled with Husband’s unique blends of spices and sauces allowing the product to become the logo. The red door not only directs people to the entrance when they get there, they are met with a life-sized cleaver door handle. This provides yet another brand signal, giving people a way to talk about the brand and something special enough to share on social media. 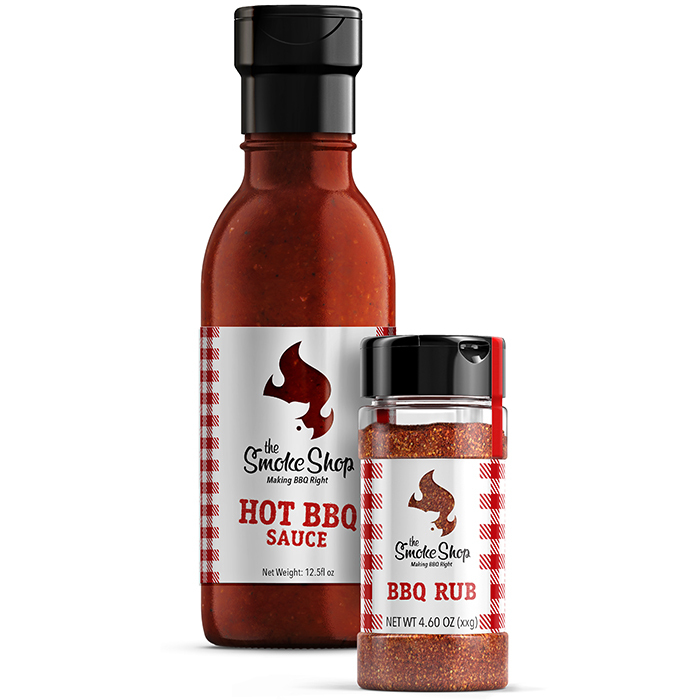 Rather than reinterpreting the “The Flaming Pig” and its logotype as signage, we embraced the eclectic nature of BBQ as a culture and drew upon techniques and materials that help to underscore the brand’s authenticity. 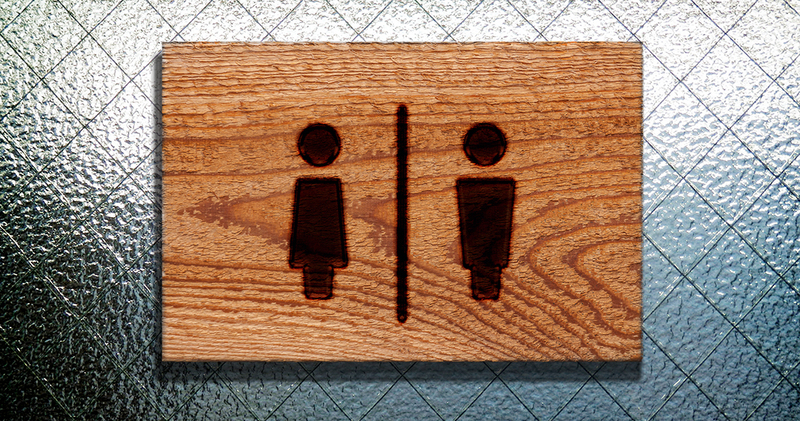 From business cards and gift card presentation to bathroom signs, wood veneer was used not as an architectural element, but as a printing substrate, bringing a subtle touch of authenticity to areas that are often overlooked.